How many Units (300 gram)? Recommended Purpose: Supportive nutrition for Doctor recommended diet and exercise plans that are designed for cardiovascular health. Please visit your Medical Doctor for a full blood workup, diet and exercise plan. Cardioflex Q10 is based on the research by world-renowned biochemist Linus Pauling PhD (1901-1994), two-time unshared Nobel Prize Laureate, and recipient of more than 40 honorary degrees is regarded by many of his peers as one of the world's greatest scientific minds of the 20th century. In his last interview with the British journal of the Institute of Optimum Nutrition he spoke these prophetic words. The "therapy" he spoke about was formulated after decades of scientific and clinical research and was introduced following issues of his patents 1994. How does Pauling's formula work? It's rather quite simple. It starts with the scientific facts that poor circulation is predominantly a Vitamin C deficiency. Also lacking is, a couple of key amino acids L-lysine and L-proline. Add to that a few supportive A, B, & E vitamins, minerals like magnesium and selenium and plenty of Omega 3 oils, especially those high in DPA such as found in seal oils and there you have it. A formula which when taken therapeutically, can help the body produce collagen and repair damaged blood vessels. Following up on 1985 Nobel Laureates Brown and Goldstein's scientific work of the early 1980's, Pauling re-confirmed that all plaque in the arteries is laid down as temporarily repair material for damaged or injured blood vessels. This sticky cholesterol plaque, which the body uses to seal up the cracks and fissures, is a "special" kind of cholesterol made in our livers and not the cholesterol we ingest from fatty foods. Lp(a) cholesterol is manufactured as a necessary emergency 'secondary response tissue' to deal with the damaged blood vessels. This happens only when the body is malnourished. The 'primary' healing tissue for blood vessels is "collagen". Collagen needs high levels of Vitamin C and amino acids such as lysine and proline, to be properly and adequately synthesized. Also, L-lysine and L-proline act as Lp(a) binding inhibitors. So there is hope for the majority of those who have damaged blood vessels and poor circulation. The results of using the Pauling protocol are predictable and measurable. Remember: Adopting a healthier diet and a regular exercise routine accelerates any healing process and puts you on a fast tract to optimal health. Mix 10 g (1 scoop) into unsweetened juice or water once daily or as directed by your Health Care Professional. Medicinal Ingredients: L-Lysine 2800 mg, Vitamin C (L-Ascorbic Acid) 2000 mg, L-Proline 750 mg, L-Glutamine 500 mg, L-Threonine 500 mg, Natural Whole Blueberry Powder 470 mg, Vitamin E (dl-alpha tocopheryl acetate) 300 IU, Vitamin B6 (Pyridoxine HCl) 50 mg, Calcium (Calcium Citrate) 50 mg, Potassium (Potassium Gluconate) 40 mg, Magnesium (Magnesium Citrate) 33 mg, Vitamin B3 (Niacin) 6 mg, Folate (Vitamin B9) 1000 μg, Vitamin B12 (Cyanocobalamin) 23 μg, Vitamin A (Palmitate) 2000 IU, Selenium (Selenomethionine) 100 μg. Non-Medicinal Ingredients: Fructo-Oligo-Saccharides (Chicory Root), Stevia Leaf, Natural Blueberry Flavor. When I started taking CardioFlex Q10 I noticed an immediate effect of well being. All my aches and pains vanished from my spine and joints. My skin tone improved remarkably. There was a marked difference in the appearance of my skin. My immune system was greatly boosted. I was much better able to deal with a very stressful job. People at work noticed a positive change in my behaviour. I was calmer with a feeling of well being. When I started taking the Liquid Ionic Magnesium a few weeks later I slept a much deeper sleep that I had been accustomed to when I was younger. I felt yet another deeper level of well being. I have only been taking these products for about a month and am hoping the CardioOmega 3 will help to improve my memory. I mix the CardioFlex Q10 with BodyFlex AM every morning in a protein drink so I can start my day feeling better and more able to cope with the rest of the day. Every two weeks I try more products and am very happy with the quality of the products as there has been a noticeable effect on my health. "I've been using Cardioflex Q10 for 4 months, I know its working. I feel more fit when I walk up a couple of flights of stairs. I'm looking forward to seeing my cholesterol test on my next physical." 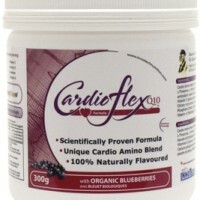 I used Cardioflex Q10 for only 20 days so far, and each day I feel better and better. I can really tell its working. I'm happy I heard about it. Just a month ago I was in the hospital with heart problems." "I had tendonitis in both of my wrists from playing hockey in my younger years. I heard CardioFlex Q10 could repair the connective tissues in my wrists so I started taking it every day once a day. After 6 months on the product I have no symptoms of tendonitis and I have full movement of my wrists with no pain. I am very impressed with this product and would recommend it to all my family." "I've only just used one jar until now, but already I can tell the difference with my energy and strength when I'm working. I'm definitely going to keep using it." "Recently one of my customers told me an amazing story of how Cardioflex Q10 greatly improved circulation in his hands and feet. He had suffered for several years with cold hands and feet and he said Cardioflex made a huge difference in only six weeks of daily use." "Three months ago, I could only do two hours of chores on my beef ranch and then I was too exhausted to carry on. My situation is that I am on a waiting list for heart valve surgery so I am facing some cardiovascular challenges. Now after three months of daily use of the product "Cardioflex Q10," I can work for a full 8 hours. My wife says that she can tell I am getting better because I look great and I feel great. If things keep going the way they are now I may be able to possibly avoid the heart surgery." "After one day of taking Cardioflex Q10 3 times my husbands breathing was a whole lot better. Less labor involved with breathing and his face was less red and the dark circles under his eyes were gone." "After one day on 3 scoops of Cardioflex Q10 I noticed an increase in energy and I was not tired at the end of the day." 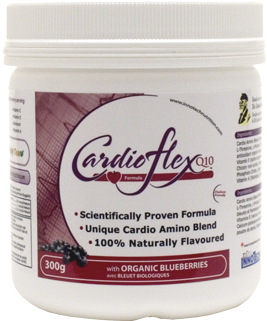 "We have had many customers using the Cardioflex product for several months now. We have had several people comment on how much better they feel in general (including my father inEngland who also uses it now). I know of 2 men who were suffering with serious Angina pain, who are both now free of pain, and of course great advocates of Cardioflex. Thanks Innotech for such an effective product"